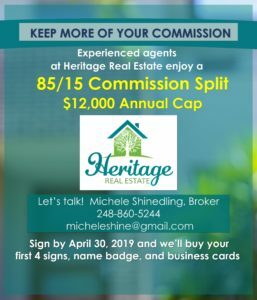 We are always looking for talented agents to represent Heritage Real Estate. That’s it! We have totally simple & transparent commission structure. Sign by April 30, 2019 and we’ll pay for your first 4 signs, name badge, and business cards!